Faintest praise: i think Clinton will be less disastrous. Great D Street Bridge event the other day. I was going to call it “spectacular” but realized i’ve reached an age at which the slightest improvement on the mundane is impressive. There i was, Segwaying to the post office via the D Street Bridge in hopes of catching a tender about to open it. Alas, no tender in the cabin, but i spotted out of the corner of my eye to the south a large catamaran just sitting there in the river with her sail furled. Hmmm, i wondered as i crossed, has her motor conked out or is she waiting for the bridge to open? Got about a block and a half before i decided to postpone the post office and just wait around. Turned back onto the bridge, and yep, a tender had just arrived, so i whirled around over to the foot of C Street where there is an excellent vantage. Oh, was my timing ever superb. Just as i dismounted, the bridge horn started blowing to signal the closing of the roadway barriers. 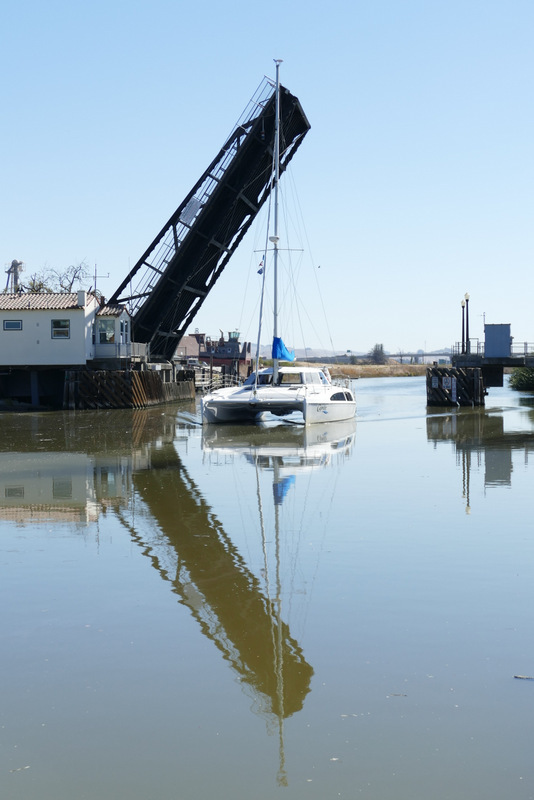 Whipped out the camera and got some shots of the bridge opening and the boat passing through. As the bridge starts to open. Fully open with the catamaran approaching. 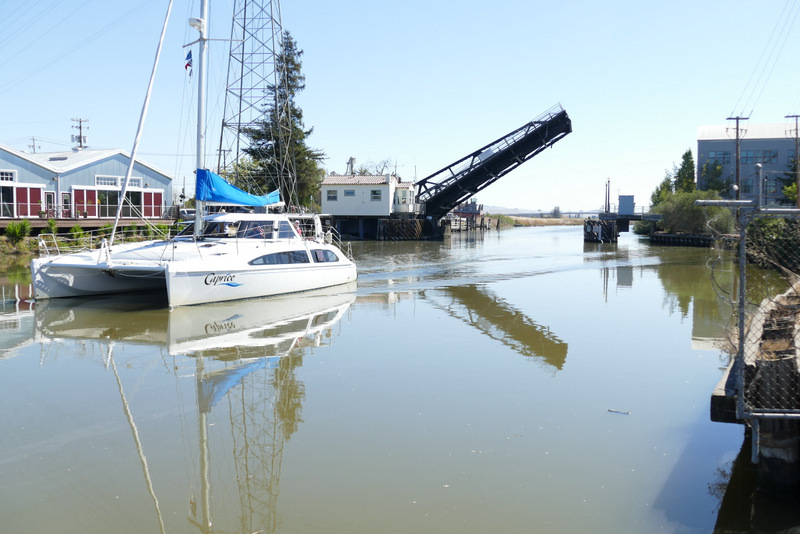 Catamaran clear and bridge closing. Oh, but there’s more good news. When i went back across the bridge to thank the tender, he turned out to be a delightful young man who invited me inside the cabin and gave me a complete tour with operating information, history, and photo ops. 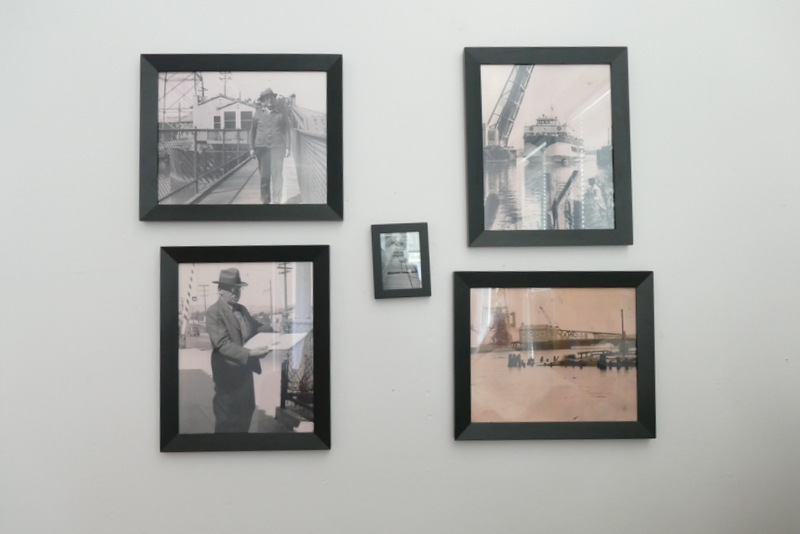 The bridge was designed by Leon Hagop Nishkian in 1933, and when it was new, the two tiny eastern rooms in the cabin were occupied by the bridge tender, it being routine in those days for lighthouse and bridge tenders to be domiciled on site so they could work 24/7. Here’s the main room with all the controls. 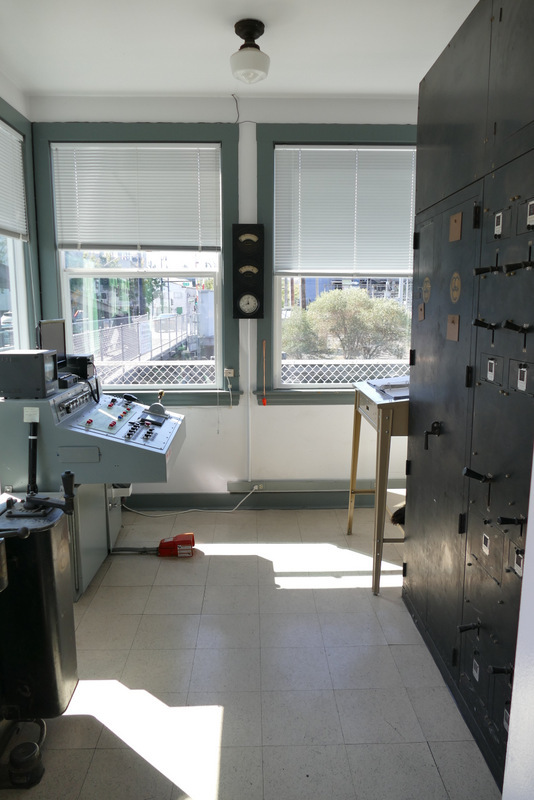 The old controls have been left in place, inoperative, at this end of the room. And here’s a closeup of the new control panel. Here’s the tender at the controls. He corrected me when i called him the “tender”, saying there wasn’t actually a tender anymore. The guys just take turns operating the bridge as necessary. 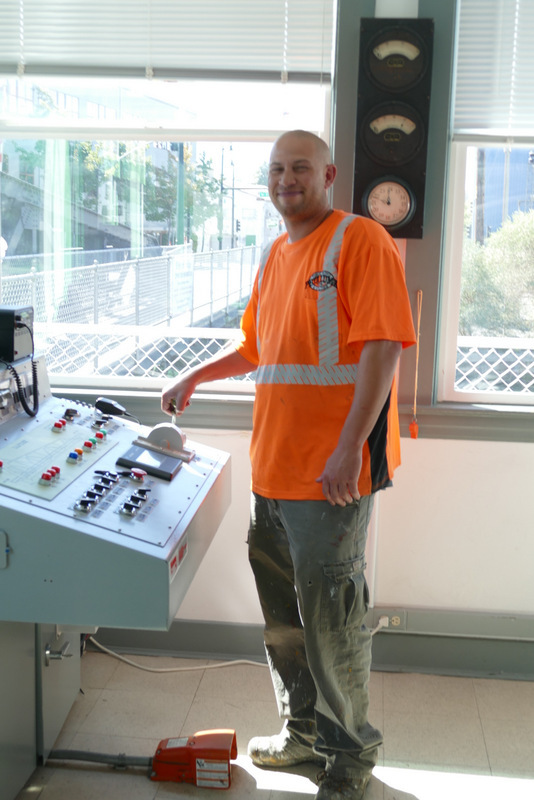 Note that since he’s not actually operating the bridge, his foot is not on the dead man switch. And finally, some historical photographs on the wall. Leon Nishkian is at the left. So cool! 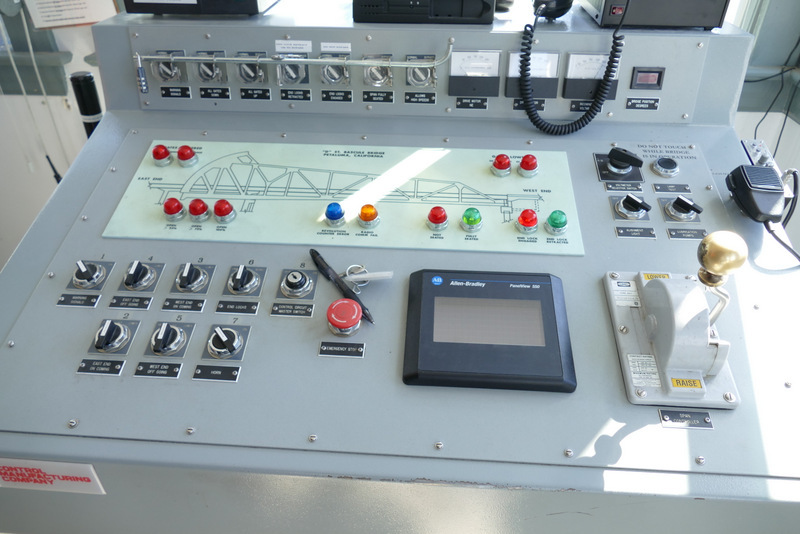 Cool to see the yawning bridge and its reflection, meet the non-tender, and check out the control room. Lovely that they have photos of old there too. And that you were invited into the inner sanctum. And that you shared the experience with us, your loyal readers. I wonder who pays for it all. Petaluma? 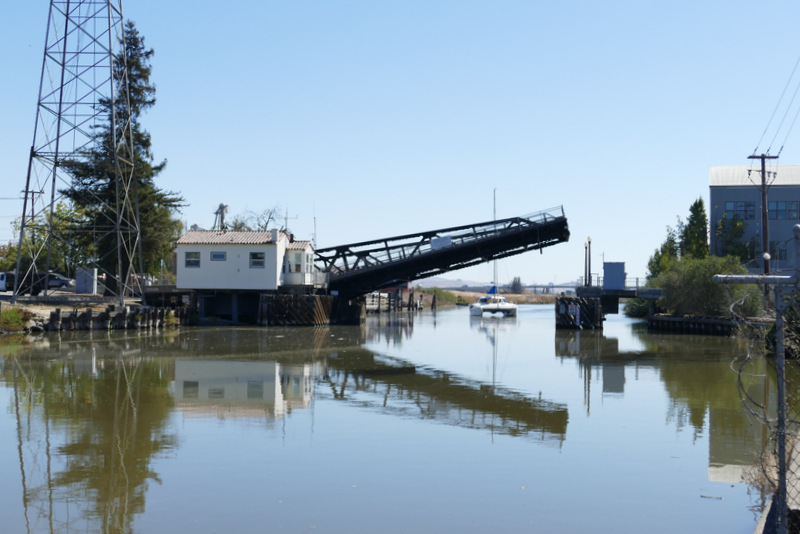 Sonoma County Waterway Authority? Do the ships that need the bridge opened pay anything? How much does it cost in energy to open and close the bridge? Delighted that somebody enjoyed this post since getting the material was so much fun, and many thanks for this insightful comment. Regarding who pays for it, i have to assume that the costs are born by the taxpayers as they are for all bridges, and i have never read of a fee being charged to open a drawbridge. 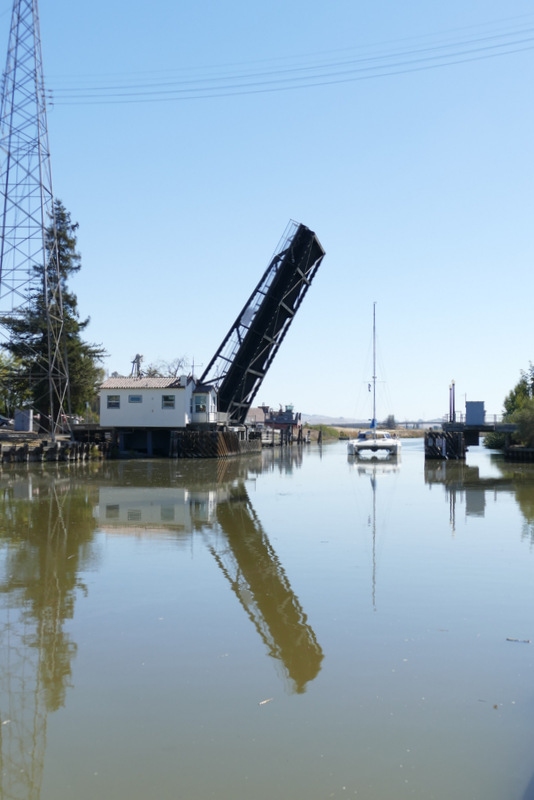 The rationale behind virtually all drawbridges is that they are so much cheaper to build than fixed-span bridge since they can be so much shorter and lower, particularly in the case of railroad bridges, that the cost of operating them takes many decades to catch up with the initial construction costs. Energy costs to operate them would be negligible since they are virtually always counterweighted to a near perfect balance. The only exception i’m familiar with is the new Islais Creek bridge on Illinois Street Bridge in San Francisco, an innovative mechanism lifted by a couple of massive hydraulic pistons as documented in my “Drawbridges of San Francisco” photoessay. The reason we see so few new drawbridges is that they inconvenience motorists by causing traffic backups when they open. Can’t have that nowadays.